Buy promotional sticky post it notes, custom printed with your graphics with a 2 colour print. Each sticky note pad comes with 40 pages as well as one backing sheet. The adhesive is located on 1 side of the sticky note. You may choose to have the adhesive on the side, top or bottom of the sticky pad. 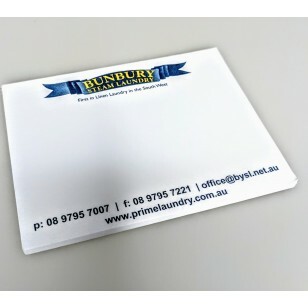 The displayed price for this sticky note, includes a 2 colour print of your graphic or logo on each page. Ask us for a free mock up of your graphic onto this sticky note. To brand your graphics and logos, we require your images to be supplied to us via email in an Adobe EPS or PDF format saved with vectorised outlines. The turnaround time for standard orders is 2 weeks, If faster delivery is required, please tell us when ordering. At the moment we only supply our 2 colour printed sticky notes within Australia only.